aspect of the interaction with potential customers. Â However, there are strategies that use pre-recorded webinars as a lead generating system. Â The question is, how do you take advantage of this powerful marketing method while saving your precious time via a webinar replay solution? Â Read on for more! The question of how to make a prerecorded webinar event look live is one often asked by overworked online marketers. The reason they’re interested in getting the answer is because they’re tired of physically hosting the events themselves. Think about it for a moment. Let’s say that you have 3 webinars running each week for your email list. Assuming each webinar is approximately 2 hours long, and you’re already looking at at least 6 hours down the drain. That’s not even counting the prep time to set the webinars up. Now imagine that you’ve prerecorded these events at your leisure, weeks prior to airing the events. There are a handful of benefits to this technique if you know how to make a prerecorded webinar event look live. An important element to a live presentation is that they’re often not perfect – since they’re done on the spot. Keep that in mind while you’re producing your prerecorded webinar. Keep it loose, and don’t edit the thing to death. A “perfect” presentation is usually a big give away that things are not happening live. Another great method to make a prerecorded webinar event look live is by using time sequencing to run a call to action. This is a far more advanced technique to grasp, but well worth the effort once understood. It entails recording a segment in the webinar where you (the host) instruct your viewers to check their emails, because “you have just sent them something”. What is actually happening behind the scene is that an automated sequence has fired of the email on your behalf. You could be fast asleep, and your viewers are guaranteed to receive that email. If you’re having a hard time with these, and some of these concepts appear to be going over your head, don’t worry about it. As with anything else that you’ve had to learn for your online marketing business, this is no different. A little research goes a long with this stuff, and there’s really no need to rush. The beauty about learning how to make a prerecorded webinar event look live is that you only need to do it once. Again, while many of these concepts may appear to be well beyond your current comprehension of webinar presentations – they’re not. It’s actually really easy. With the right webinar replay provider, most of it has already been done for you. Stealth SeminarÂ is my favorite automated webinar tool – and it’s affordable to almost everyone. Automated Webinar Services – You Can Cash In On Them? Webinars are a great way to create an additional revenue stream for your business.Â Using the right webinar service can make it easier and more automated so you don’t have to use that time for setting up things that can be done automatically.Â This article talks about how to use automated webinar services to create that additional residual revenue stream for yourself. Webinar Replay for automated replaying of your webinars – Residual revenue benefits! Automated webinar services are one of the best ways around for online marketers to increase their monthly cash flow. The webinar aspect of online product selling is currently experiencing its highest popularity peak. Consumers have grown accustomed to attending these events, which are usually informative in nature with a product pitch near the end. Becoming proficient at setting up webinar events is an integral part of having success with automated webinar services providers. A flawlessly executed presentation can boost conversions well beyond the 300 percentile range. A rough execution will typically have your prospects running for the door (aka – closing their browser windows). The first thing to consider with automated webinar services is the platform of choice for your webinar presentations. Traditionally, marketers have had to host these events right from their own at home computers. This usually meant that there would have to be a person present to hit start on the presentation button, as well as being susceptible to a wide variety of technical errors. Things like internet service provider interruptions usually meant hundreds of webinar participants would lose connection with you, and the presentation would be considered a complete flop. Luckily things are changing. Advancements in the field of automated webinar services hosting are making it possible for online marketers to eliminate many of yesterday’s headaches. There is no longer a need to worry about things like internet service outages, or time scheduling in order for you webinars to be a success. Now you can simply automate the entire process while you sip margaritas on a sunny beach. With today’s webinar platforms, marketers are capable of producing and airing webinars which feel and look live. Automation sequencing allows a multitude of actions to fire off during your presentation ensuring that events run smoothly without your need to physically participate during the telecast. Even things like internet outages become a thing of the past, as these technologically savvy webinar platforms run on back-room servers maintained by the webinar hosting company. Using old methods to compete in the modern world is a dying proposition. A good place to begin changing your business model is by starting with better managing the way your online brand is perceived. Consumers always take note (many times subconsciously) of the way information and brands are presented. Running professional grade webinars can give you the competitive edge you’ve been looking for – but you’ve got to get the setup right. Finding an automated webinar services provider that has the capabilities mentioned above will be your best bet for a smooth and successful transition. Webinars are a great way to market your business, draw in more leads and customers as well as create an additional revenue stream for your business.Â In order to take the most advantage of this method, you will need to use the right webinar service that will allow you to do things such as record your webinar and notifiy the webinar attendees of the webinar as well.Â Read on for more about what other tings you should look for when you are choosing a webinar provider. Put your webinar replay on autopilot and get paid over and over for them again. One of the most common questions I get asked about webinars is which platform to use. In fact, some presenters spend too much time evaluating and assessing every webinar platform trying to find the “best”, when they would be far better off just choosing one that works and actually running webinars. There are a bewildering number of tools available for conducting webinars and on-line meetings, and new services crop up every few weeks. This makes it a fiercely competitive space, which is good for us as customers. However, it also means it’s difficult to choose the right provider. Most of them offer a core set of services – such as showing PowerPoint, hosting a chat room, a question box for participants to type questions, and a recording facility. Some also offer additional services – such as multiple choice polls, automatic e-mail reminders before the webinar, seeing the presenter on webcam, audience microphones, and post-event surveys. If you’re getting started, here is my advice: Choose GoToWebinar (the service I’ve used for many years). It’s powerful, reliable, affordable if you’re doing a reasonable number of webinars, and has all the features you need for delivering high-quality webinars. Webinars vs on-line meetings: Many of the services are excellent for meetings (group discussions), but don’t have specific features to help you run webinars (presentations) – such as good registration pages, automatic e-mail reminders, polls and attendance reports. Price: Of course, the price of the service is an important consideration, but it’s not always easy to compare different services because a number of factors affect the price – number of attendees, number of webinars, and so on. Advertising: Some of the free services are supported by advertising. That’s the price you pay for the free service, but it doesn’t look professional if your webinar participants are seeing ads during your presentation. Limits: Check what limits the service imposes – for example, number of attendees, number of webinars each month, length of a webinar, availability of the webinar line during busy times, and so on. Of course, some limits are to be expected; just be aware of them when evaluating a provider. Geographical features: Webinars are, by definition, for participants to access remotely, so be sure the platform supports international participants. This can be as simple as allowing participants to register in their own time zone. Screen sharing: Can you share anything on your screen, or do you have to upload your presentation to the webinar provider (that’s less flexible)? Audience microphones: Can you allow audience members to speak during the webinar, or can you only take written feedback? Audience engagement: In what other ways can you engage with your audience? Examples are polls, chat rooms, switching to their screen, and so on. Social media integration: Some webinar providers make it easy for you to link your webinar to social media – for example: creating the webinar as an event on Facebook, using a Twitter back channel during the webinar, or uploading the recording to YouTube. This can be useful if you’re running a lot of free promotional webinars and you’re active on social media. Recording: Is it easy to record your webinars and make them available for later playback? If the provider hosts the recordings, do they give you unlimited space? This isn’t a comprehensive list by any means, but it does cover some of the most important factors to consider. Gihan Perera is the author of “Webinar Smarts”, the smart way for professional speakers, trainers, thought leaders and business owners to deliver engaging and profitable webinars. If you want to know how to reach the world with mic, screen and mouse, visit http://webinarsmarts.com/ for your copy. Are Live Webinars Are Better Than Recorded Ones? In this article, the author seems to think that live webinars are better than recorded ones.Â He brings up some good points as to why that might be the case, however there are very work arounds to some of the points he brings up regarding webinar replays. In one instance, a workaround is not putting time sensitive dates in the webinar recording if you plan on using it over the next year.Â If you need to put in a time sensitive date, make sure it isn’t a deadline, but more of an announcement of a product or service, and refer to the date in both future and past tense.Â Read on for more! Live webinars are far better than recorded or “replay” webinars that you might see marketers use for many reasons…for starters, a live webinar shows your personality better (and gets you more trust). You can adjust for technical issues going wrong on a live webinar, and you can demonstrate genuine urgency when pushing people to join your site or buy something from you. Personality is more important than ever on the internet these days because everyone is making videos, gathering a massive social following on networking sites, and so on. If you have a sales presentation and there is a common objection, or even a few jokers and skeptics, you can adjust for this. By running live webinars, I have noticed many holes in my marketing and sales letters that I could fill up. For example, justifying the price or explaining a particular bonus that didn’t make sense previously. Next, technical things can and do wrong when computers are involved. I have tried running a recorded webinar and the recording did not play. Another time, the audio didn’t replay correctly and I had to run the webinar live anyway. Even if you trust someone to hit that play button, or you outsource it… it’s in your best interest to be present at the webinar so you can adjust if something goes wrong. Your screen might not show correctly, the audio might not look right, and you usually need to be there to fix it. 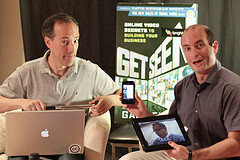 Finally, live webinars are excellent to get some real urgency going with your offer. I have lost trust with many marketers pretending to run a live webinar, when in fact it was recorded. At the end of that webinar, the marketer told me, “This offer closes this Thursday.” But the next week, I saw a link to the exact same recorded webinar with the exact same scarcity… that the offer closed on Thursday. Avoid this by running a live webinar. It will do you some good, it will give you more speaking practice and it will get you more confident in pitching your offer. You need to run your own live webinars instead of recorded ones because they are easier, show your personality, and show real urgency which will go a long way towards building trust with your subscribers and customers.